As part of the Etihad Airways global advertising campaign with Nicole Kidman and the inaugural flight into Sydney for their A380 super jumbo double decker, Wallace International was asked to manage the logistics for a special one off Etihad Airways event. The event was held at the Sydney Opera House (during the Vivid Festival ) and was to present to invited guests, the Etihad Residence concept – where two people share a living space, a bedroom, a bathroom and enjoy the services of their own butler on board – There was also a demonstration of their first Apartment model on display. Wallace were tasked with monitoring the shipments arrival via Airfreight, reporting to customs, recovery from the airport, delivery & placement at the Opera House & the return to the terminal for Airfreight back to Abu Dhabi & London. Starting the inbound logistics on Sunday, Team Wallace worked through the night to have everything ready for the event on Monday, with the outbound completed Tuesday. 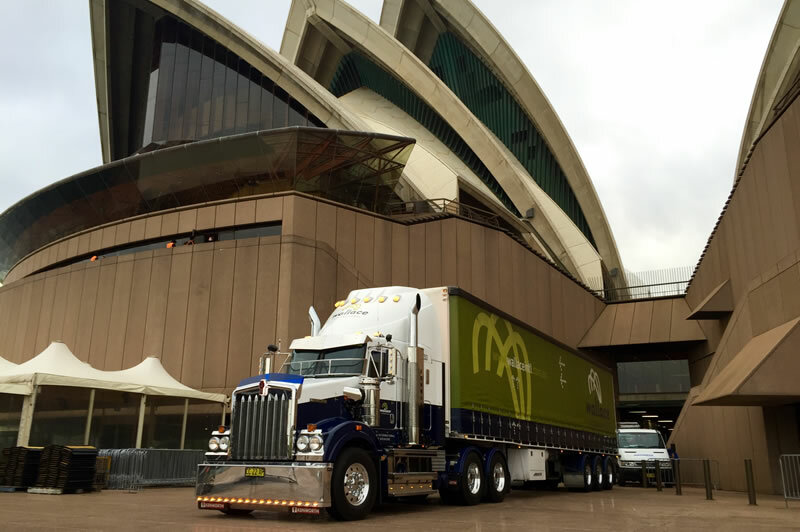 Using our own Kenworth Prime Mover and Isuzu rigid trucks gave us total control of the project which made it seamless; it also provided the right security clearance required by the venue. The result was a very happy customer and another job well done by all involved after many hours planning in the background.